English Translations of The Great Mirror of Folly Plays and Poems - IFA Vintage and Current Book Library - Index Fund Advisors, Inc.
eBook: This is an interesting video introduction to the book by Professor William N. Goetzman, Edwin J. Beinecke Professor of Finance and Management Studies & Director of the International Center for Finance at Yale School of Management. - MarketUpdate did a nice translation of several prints. Translations are copyright Index Fund Advisors, Inc. 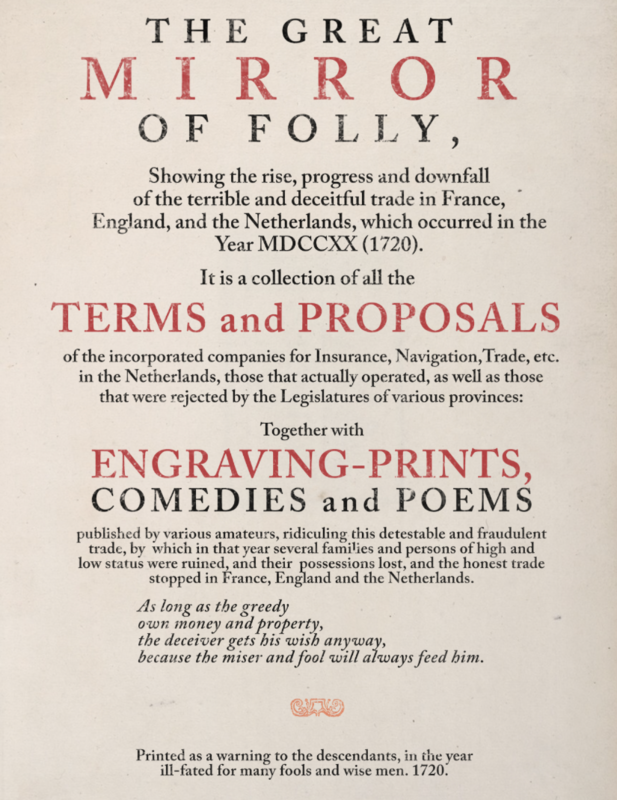 The original book includes many plays, poems, songs and security prospectuses. Here is a translation of a popular play that was performed at Yale University in 2008 during a conference about The Great Mirror of Folly. Kapitano: Hello mister Arlequin! Welcome, my good friend. Arlequin: Hi, Kapitano! You are in such a hurry, where are you going? Kapitano: I am going to give orders to get the ships ready. I hope to reach the SOUTH this year and become rich by making huge profits. Arlequin: So, are you going to explore the unknown SOUTH? Oh captain, that takes a lot of courage. But if it works, more power to you. How much profit do you think you'll make? Do you know how to navigate the seas? Who are your navigators? And what crew will you take with you? Kapitano: I am the captain, Scarmoes will be the navigator and Kolombine is the cook. So there is no need to worry. And Dr. Mezetyn is our ship's barber. Arlequin: What cargo will you take with you? Arlequin: Hah, Hah! Paper! Paper! That's a good idea. Paper is very profitable. Is it just writing paper that you take with you? Kapitano: Listen... my paper is the best there is! Also, I have the best French, English and Dutch foolcaps. They are very good and are made very well from the best Mississippi Cloth by a man who owns the mill. Everyone in Europe wanted to copy him and they tried to buy a share of that Mississippi Cloth. However, it didn't work because that man had the monopoly. Arlequin: I have gotten some cloth like that from the SOUTH and it is at least as good as the cloth from Mississippi. I am going to make good money with this cloth in North Holland. Kapitano: Ah, mister Arlequin... my friend! Could you please get me a shipment of that cloth. I'd thank you for that and I will return a favor for your generosity. Arlequin: Look captain, I can't help you. I have to inform you that as of yesterday I have rented a nice place near Quincampoix from where I plan to sell to the public. Kapitano: And when will you open your new store? Arlequin: Soon... let me know if you are interested because nearly all of my goods will be sold by the end of the week. Kapitano: OK, I want a big crate of your best stuff. Arlequin (standing in front of the store and shouting): Hey Gilles! Gilles!... bring a full crate of the goods overhere! Kapitano: Hah, Scarmoes and Mezetyn that's good timing... I need that box. Scarmoes: Your money is in the box, I didn't dare to trust anybody with it. Kapitano: Come here and give me the money. I'll keep it safe. Mezetyn: Here is your treasure my Lord... I mean your paper, the modern paper money which is very valuable. Kapitano: Now Arlequin, tell us what you are going to put in that big crate. Arlequin: I got three dozen pipes which were made for me in Tergon. Also, I've ten pounds of the best tabacco which I had ordered from the island of Amersfoort. And then there is a special cake and a pack of playing cards, a pan filled with bacon from Schiedam and pigtails from Weesp as well as the GAPER with his mouth wide open... it used to be located at the Rokkin. Kapitano: But what could I do with all that stuff? Arlequin: Look, you could throw your money in that wide open mouth of the GAPER who will eagerly devour it and when he is finished eating he'll poop nothing but shares. You can sell these in the SOUTH for a handsome profit because they are more valuable than gold or silver coins. Scarmoes: Well Arlequin, I will believe it when I see it. Arlequin: OK, if that's how you feel, I'll simply keep the stuff. Come boys and take the crate back upstairs. Kapitano: No! No! That is probably the famous GAPER. I want to take him with me. Arlequin: For half of the profit? Arlequin: And here is the herring which you can grill; and this is the calf's head which makes good chops. And there is the spindle from Purmerveer which Kolombine can use if she wishes to spin yarn. And look here... a stork! Kapitano: What am I going to do with that? Arlequin: This will help you in making friends in the SOUTH because I've heard that's where the Stork-family started. They reign there and they are very properous. Kapitano: OK, but stop putting anymore stuff into that crate. Arlequin: I'll top off the crate with cabbage and carrots from Hoorn. Kapitano: Stop it! I've enough... what's the matter with you, are you crazy? Arlequin: I have only one more item and then the crate will be full... the rat trap. Kapitano: Now mister Arlequin, how much do I have to pay you? Arlequin: Let's see... that is one, that is two... if I am not mistaken, it's worth half a pound of shares. Kapitano: Which shares? How are we going to do this? Arlequin: Well, first mix them up thoroughly and then weigh them. Kapitano: Is there a porter here? Arlequin: But of course. Everyone who lives around here has a porter. Mezetyn: Let me borrow a wheelbarrow and I will be your porter. Help many, many poor devils"
Kapitano: Oh! Oh! Dear God! Oh no... where is my stuff?! You scoundrel! Oh Gille, you crook! Damn, where are you! Mezetyn: Oh no! These rascals have fled! Kapitano: When I catch them, I'll pick them up and cut them in pieces with my sword. Or I'll make them into sausages and roast them on the grill. Scarmoes: Good thinking, we already have the guts. Kapitano: Come on, let's all go to his house and let's help each other. Arlequin: Get away from my door you guys or else I'll come and get you. Kapitano: You idiot, how did you become rich so easily? Come outside and I'll break your neck and your legs. Arlequin: Wait and I'll come and see you in about a week... today is mailday and I still have to write some of my letters. Kapitano: You are a crook! A crook! Arlequin: Hey, your bitching makes me laugh. And if I had the time, I'd stay and listen for another three or four hours. Kapitano: You wind trader! I demand that you return my paper, my precious money, or else I swear you won't live another minute. I'll fling you up in the air. You will never find a safe place to hide from my justified wrath ... not even on the moon. And when I DO find you, I'll take down your pants and blow with the bellows so much wind up your behind that you'll explode with such a force that it can be heard in the SOUTH. Arlequin: And in turn, I'll show you MY courage. I'll be determined and come after you with this bladder which is filled with beans. You'll be very terrified and would want to crawl into your hiding place. Kapitano: Come on guys, follow me to my house. I'll give you weapons and then we'll fight Arlequin because this fight can only be settled by blood. Marionette: Well captain, where do you want to go? Kapitano: Oh Marionette, do I always have to use my sword and helmet and rule the world by showing my teeth? Marionette: Will there be a happy feast afterwards? And would you like a ham or a sheep roast? Kapitano: I am going inside. Everyone must be ready to show the flag. Kolombine: Well it looks like the idiot came back again. I thought we were going to set sail and take all the stuff with us to the unknown SOUTH. But look, here comes Arlequin. Marionette: Well hello Arlequin! My dear! My hero! My trading prince! My Lord of the SOUTH SEA! Oh! My Baron of Mississippi! Arlequin: My queen of all BUBBLES! Oh! Are you leaving me now? My dear, are you going with Kolombine? Are you going to leave me and go away with the hunchback? I shall burn all my shares which will ruin you. I will set myself on fire and die on the pole with all my wealth. Kolombine: Take it easy my friend... there will be no voyage. No ships will leave for the SOUTH. We only pretended this in order to drive up the share price. Marionette: So, is the voyage cancelled? That's great... you are really clever! Kolombine: Come... let's go and see what the captain is doing. Kapitano: Come and get ready to do battle. Where is the cavalry? Line up behind me. I think that Arlequin will get to the open battle field soon. Turn right and put your guns to your shoulders!!! Scarmoes: Wait my big hero... don't you first want to line up your people in proper order? Kapitano: No, I want to charge ahead! On to the battle field! Draw your guns... I'll show you how to fight... FORWARD MARCH!!! Arlequin: My heroes who follow me so ardently and respectfully while carrying my banner, will reap the glory! Don't be afraid because Kapitano will soon loose the battle. The person who takes him prisoner will be rewarded with six shares of Muiden as well as a white paper crown which is more valuable than a laural wreath which Scipio used on such an occasion. And he who brings Scarmoes to me alive will receive six shares of Zwol for free. Other spoils of the war will be divided up and given to the rest of the people. Altewaal: Long live Arlequin! Long live the General! Arlequin: I confiscate the property of Mezetyn, that sly rascal! March on, go ahead! We're almost there. Careful gentlemen... I see the enemy overthere. Kolombine [from the open window]: Overthere, you can see the fools fighting like crazy! Kolombine: Well, Arlequin is quite a guy... he bravely attacks his strong enemy. Marionette: That "wind battalion" won't kill anybody. Kolombine: Even so, I am still scared seeing how they beat each other up. However, Kapitano is a real coward. Did you see how he trembled when he was hiding in the bushes? He was already scared before the battle started. Scarmoes: So mister Arlequin... you have been caught. Arlequin: What's wrong with your captain? Is he scared stiff? Mezetyn: How is it that a prisoner still dares to make jokes! Or do you believe that you, with all your tricks, can escape again? Oh no, we are not worried about your schemes any longer. Come on men, let's put him in the cage! Kolombine: Where are the others? Mezetyn: Well, they fled. Anyway, Arlequin tried to kill Kapitano with a heavy blow after Kapitano had lowered his pants because he had to go urgently. Mezetyn: He'll be punished. I am sure that he'll be hanged for this. Scarmoes (while shivering ): Uh, uh... something tells me that Kapitano is alive. Mezetyn (shaking ): I am shaking all over. Kolombine: He is unconcious. I'll give him some smelling salts. Scarmoes: Oh no... it doesn't work. Now I am shaking even more. Let's try some strong spices. Mezetyn: That won't work at all. The best way for him to wake up is to let him smell Jenever shares which is a lot better than spices. Let's not waste anymore time and lit up some shares. Scarmoes (holding a burning share under Kapitano's nose): See... it works!!! Kapitano: Where am I, Mezetyn? On Elysian Field? Where is Arlequin? Scarmoes: No, you are here on earth with your friends. And Arlequin is locked up in his cage. Kapitano: Did you capture him with your strong and capable leadership? Scarmoes: The honor belongs to you Sir, because you were very courageous. The GENERAL always gets the honor and glory even if he watches the heroic battles, fought by others, from a distance. Kapitano: Open that cage at once so that I can kill that rascal who wanted to pay for my shares with WIND. Arlequin: You phony people, you are making such a fuss. How can you get carried away by such a crazy rage and reject so easily the honest Commerce by becoming wind traders to the detriment of the country. Yes, contriving all kinds of WIND projects... taking money from people and sharing it with traders who pay only with WIND. People are ready to do this day in and day out... too bad! I'll leave now and go to an entirely different part of the world. You can live off the interest, however, you can easily go bankrupt when you sell your shares for WIND. And you can loose 10% of 300 million when you play these tricky games. Scarmoes: Who do you think that person is who preaches like that? Kapitano (kneeling): Oh, oh... Oh! It's God Mercury! Arlequin: Don't expect forgiveness because I know how wicked and deceitful you are. Scarmoes: Hah Arlequin, you wise guy... you won't fool me! Come on men bring the cage here, he must not escape from us! Look, God Mercury is locked up in his cage, he will be hanged tomorrow in honor of Quimcampoix. Arlequin (sings): What would I do in a world where everyone talks about WIND trade, rejects Commerce and abandons the usefulness of the stock market so that everyone can play a game. Where thousands of fools till late at night expect a profit for WIND... where Jew and trader try to confuse everything with their greed. Scarmoes (sings and is joined by the choir): In the future we will only trade the very best shares so that Mercury can have fun and walk free again. Arlequin: But mister Scarmoes, I see that you recognize me. I beg you to go and get Marionette because the end of my life is near and I must make my testament before I die. Scarmoes: That's not necessary because she is already on her way. Marionette: Oh, isn't that mister Arlequin in that cage? Arlequin: My dear, my Marionette, when I die you'll inherit my shares together with mister Kapitano and mister Scarmoes... because I forgive them all the harm they have done to me. I never hated either one of them. Mezetyn: Would I and Gille get some of your wealth as well? Arlequin: Sure, you and Gille will get your share eventually. Kapitano: Well Arlequin, you gracefully accepted your death sentence and because of this noble gesture, I'll give you your life back... on the condition that you give away all your shares. Arlequin: OK! Sir, a person's life is worth a lot. Dear Marionette, here is the key... go and get the bag which I've placed in the small bedroom. Kapitano: What do you think will happen to the trade wind? Arlequin: Wait a minute... I first want to sell you something that's beautiful (he lights a candle). Look here my friend, this is an eternal light. A light that never goes out or flickers in front of your eyes. It's ignited by the rays of the sun. It's made very well and has absolutely no flaws. Kapitano: How much do I have to pay for that? Arlequin: It's worth at least a nickel. Kapitano: I don't have cash because that was taken by the government. But OK, I'll give you two shares of Muizen for it. Arlequin: I am not interested in any of your shares... but cash will do. Kapitano: Here, this is my last coin. Arlequin: I would never have sold it to anyone else for such a small amount. Kapitano (holding the light): How beautiful it is... holding this light in my hand! The person who has no lit candle would be in the dark. Wow, that Arlequin was certainly not very bright to sell this light for such a low price! Scarmoes: I'll give you two shares of Naarden for that light right now. Kapitano: No, give me three shares of Hoorn which you already had saved. Scarmoes (with the light): I am happy... wow it's almost too good to be true. Mezetyn: OK, I give you ten shares of Zwol for the light. Scarmoes: No, give me three shares of Rotterdam and seven shares of Enkhuizen. Mezetyn: No mister Scarmoes, I am happy with my valuable shares and won't trade them. However, do you want a hundred shares of Enkhuizen which I own as well? Scarmoes: These are shares of a company that's already bankrupt! Marionette (scattering papers from a basket): This is your inheritance... see, it's all there. Scarmoes: Come on, I offer a hundred shares of Edam as well as seven shares of Utrecht, Delft and Tergou. Mezetyn: Wow! Man that's quite a bit! Scarmoes: OK then, if you want a deal... say so. Mezetyn (with the light): OK... without further ado, I'll take that beautiful light for that price. But look... the candle is very short, I wasn't thinking again. I have been deceived! But before I return the candle I'll try to deceive someone else. Hah, hah... I know the world is full of fools. Light is the most valuable thing and nobody can live without it. I am a lucky guy... I got it for next to nothing. It glows in my hand like a bright star in the darkness. What in the world would you do without such a light? A country where one has such candles is fortunate because if there is no light people couldn't see at night. Gille: Here, I give you my inheritance. Gille: Oh glorious light. Oh the joy of our lives. But wait... the candle is almost gone. Oh, you rascal Mezetyn. I thought that it would last much longer... oh you crook. Marionette, how much do you want to offer? Marionette: I don't want it because I'll get burned when the candle gets shorter. Gille: Well, make an offer anyway because it's still worth something. Oh no... I burnt my hand! Oh, oh it fell out of my hand. Arlequin: Now you see what can happen to the BUBBLE companies. Mezetyn: Our inheritance is gone... who would have expected that! Kapitano: What shall we do... now that we know that the wind trades are worthless? Arlequin: Well, we can always help digging another Stichtsche Canal. lust for money and wanting to devour the gold. But wait, they choked on the bits and pieces. and in pain. She curses and scolds the gutless attempts to make profits and piles of gold. King Midas, with pointy ears, has bags of gold and silver. Every miser is begging and flattering him and pleading to give them a large treasure to live on. immediately "... but without money, I'll let nobody enter". Those who remain outside the port moan and whine... oh, what in the world shall I do? No reasonable person would advise to continue even longer with wind trading. It's best that he constrains himself while those inside the gate sing cheerfully. [Gelderman lives in the province of Gelderland and Hollander lives in the province of Holland... Gelderman is the " good guy " and Hollander is the wind trader]. G. What madness is spreading to your cities in these miserable times? H. We desire to eliminate poverty, a curse that rages in your region. G. Who complains about that? Overhere, everybody... young and old... is content with their lives. H. Sure! Happiness would not have eluded you, had you gotten in with the wind trade. G. No treasure would please us if crooked players would make a profit. H. I don't care how one wins as long as it delivers real cash. G. The old sailor navigates to the gates of hell to make exhorbitant profits. H. There goes the poorly paid potato farmer with his fruit and farm products. G. To have is to have, says the robber. But to get it is the trick. H. Right. Holland laughs at the poor guy. He who has money gains everybody's favor. G. The notion that nobility and wealth are better is detestable. H. Nothing is more honorable than to dig in the earth with spades and shovels, when the cash in the wallets get smaller. That's how people in your region try this. G. That's better than when the bankrupt scoundrels went to Vianen to be safe. H. A disaster nobody can prevent and he whose back is against the wall deserves to be saved. G. I could show you how not to use these tricks. G.With the law of Emperor Charles. H. Justice that is too strict will collapse. Moderation will comfort the public. G. That way, one can squeeze blood from the people with taxes that we don't have. H. How does that affect our stock market which you criticize so heavily all the time. G. Don't mention your godless ways. It has already ruined your prosperity. H. He who looses the game will always complain. But he who wins laughs up his sleeve. G. If everybody got justice, it would be acceptable. But injustice has now infiltrated everything. H. Everyone gets something and fate gives to people according to rank and class. G. It seems that nieces and nephews get some of the profits but most of it goes to the rich and powerful. H. But the disgruntled people of the Hague know how to rule and that makes people complain. G. But the displeasure of the honorable people of the Hague and their whores, hit home and that causes regret... they fight and rest. H. Which way is the jealousy going? Who profits the most from the wind trade? G. The gentlemen from the Hague and their whores; the games of foolishness and idleness are for them. H. I thought that you wanted to go somewhere else, like to the rebels in Dord. G. I have never seen that one could squelch a rebellion when people's rights were curtailed. H. In London, they handle this more smartly. And I won't say anything about the greedy people in Paris. G. There, money - grubber Law was hanged. Your region was considered to be safer. H. The desease is not in every place. Haarlem and Leyden are clean. G. One should bestow a golden city crown on these praiseworthy cities. H. And Amsterdam may brag as well; and Gorkum, pride of Arkels fortress. G. But Dordrecht did not get the crown and I won't speak of the other plundering places. H. Your Gelderland has remained pure. Wow, what an untouched virgin. G. That's true... she was praised for not having any crazy business. H. We grant you that empty glory, like a disappearing shadow. G. We dislike the bad wind trade and not just because of the money. H. It will get you places. G. Much further than the money - grubber with all his wild dreams of the raging Quincampoix on the river Y.
and pleading to give them a large treasure to live on. himself while those inside the gate sing cheerfully. Bonavontuur, merchant (name meaning adventurer). Eelhart, merchant, brother of Bonavontuur (name meaning noble heart). Hillegond, daughter of Bonavontuur and Beatris. Hendrik } admirers of Hillegond (name usually for an honest, nice guy). Windbuil } (name for wind trader). Klaar, maid of Hillegond. A barber. John, servant in Quincampoix, the coffee house. Four dancers dressed as cutters (haircutters?) and wig makers. A few Jews, farmers, also people from other countries. The stage in the first and third act looks like a room in the house of Bonavontuur. The second act takes place in the Quincampoix, the coffee house. Bonavontuur: Stop! Stop all that moaning and groaning. Why do you care if we want to trade in the South Sea? Eelhart: I am your brother. I want to advice you like a friend. Listen, these trades are nothing but wind. Bonavontuur: You’re right, they are wind: but some of these foolish wind trades will get high premiums. I agree that they are crazy and they will end some time, but in the mean time I get rich. Eelhart: You take your premiums, do you think you can deliver? Bonavontuur: Deliver what? I think the money is already mine. Eelhart: As long as you get money, you think you are a gent. But what will you do Mr. Speculator, when you have to face that these stocks are fixed? Bonavontuur: I don’t anticipate that. Eelhart: You will learn from your mistakes. Bonavontuur: It’s based on wind and nothing else, therefore the price will have to come down eventually. I think the more wind there is, the more money I’ll make. Eelhart: But tell me, did you think about the two gentlemen who are interested in your daughter? Do you like Mr. Hendrik or do you like Mr Windbuil better. Time is money. I’m interested in the South Sea. I prefer to talk about insurance, banks or the West. Eelhart: But you still have to make a decision. Bonavontuur: I repeat, time is money, stop whining because in a sec, a spec in time, I’ll win a million or I’ll lose it all. I’ve lost a ton and a half of gold, when I listened to a fast talking lawyer. He just came to my house when I was supposed to be out. I asked him if he went to the Dam, to find out how high the South Sea stocks were. He said, he saw a bunch of Jews, they yelled something like: the West! The West! and that is all he knew. But look, there is Pieter. Bonavontuur: Well why are you all sweaty? Pieter: A haddock fisherman from Wijk aan Zee came and he heard that in London they were bidding eleven hundred for the shares of the South. Bonavontuur: Hah! Hah! Hah! That fisherman is a crook, who told that story to make some more wind, to get rid of his stocks. But did you go to the Coffee House? Pieter: Yes, but it was so crowded that there was no place to stand. There was too much shouting by Englishmen and other trouble makers that I got tired of listening to all the lies of the Jews and traders. Then I walked to the Kalverstraat and again back to the Dam, there were all kinds of people there. There were liberals, merchants, also riff raff and respectable gentlemen and well dressed speculators. I saw someone who talked about millions but I would not lend him a single dime. Bonavontuur: In London the South Sea is going down. Get the trader Grijpvogel right away so he can get the premium from me, his friend. Eelhart: Boring! Talking about premiums again? Bonavontuur: I live from the wind. Go Pieter tell him that I'm waiting for him. He is still in Quincampoix, I think. Eelhart: One more time, you will ruin yourself. Bonavontuur: It is what it is. Let’s talk about something else. I think I hear my wife and daughter coming. Why don’t you stay. I still have to write to my correspondent in London. Eelhart: Why, there is no mail today. Bonavontuur: I can’t wait that long. I’ll have Krispijn send it by express, I expect my trusted servant any moment. He went to Hoorn to do some business. Eelhart: I don’t know how you make money in this kind of business? Bonavontuur: But I can see that there still is a lot of profit to be made. Beatris: Ah, brother Eelhart, what is going to happen to us? and cries: deduct ten percent mister! if you do it at the right time. Think of your own interests. Then he calls again: The West! or Medemblik! Edam! Oh, too bad! I did not take the business in Ter Gou! What does all this raving about a premium mean? on flowers that it’s scary. if they were snow white or beautifully striped. But with time they saw how foolish that was. But maybe that spirit is still here and no one talks about it. But now there is another foolish spirit! And this one is even crazier than before! will become less while they also make interest payments to you. These are called bonds, they yield interest annually. Sometimes a lot, sometimes a little. Beatris: Well, how is that possible? you don’t know and you have to guess what will happen. Beatris: I don’t understand why our country allows this. Eelhart: You know that one fool will immediately create more fools. The loonies get rich, the wise men are amazed. unless he is very lucky, then he’ll survive. crank up the prices, while pretending not to do so. But can you explain the word commission to me? Eelhart: That is a fee, you pay when you buy shares. he will deliver the shares to the buyer if he wants them. And if the share price is lower, then the seller still has the premium. Beatris: that is betting on going up or down. and bet all his money on this? if these wind trades will clean him out. Hope all those commissions agree with him. He took in a ton of gold. Beatris: I was afraid of that. Oh, how I hate this! Why do I have to suffer from a husband who gambles? Is my money going to disappear in front of my eyes ? whether he will lose or keep his money. or if Frederik Hendrik has to bail him out. Beatris: what do you mean brother? which strictly forbids this way of trading. A monopoly which our Big Twelve Gentlemen won’t punish. the downfall of useful and clean salesmanship. But dear niece, tell me weren’t you going to get married? Hillegond: Uncle why do you bring that up! Eelhart: Please explain what’s going on. one is Mr. Quincampoix, a fancy dresser. Mississippi shares in Englnad… and now he is here. Hillegon: Do you mean Mr. Windbuil? But I know you have your eye on Mr. Hendrik. And he would be good for my niece Hillegond. Hillegond: My father prefers Mr. Windbuil’s money. He says that he has more than two million. Eelhart: You’re right; he has millions. Is it paper or real money? has more than Windbuil, whose treasure is light as a feather. He follows your father, and only cashes in commissions. Hillegond: I won’t say anything now but I will decide soon. I’ve known Hendrik for a long time. Klaar: Speak of the devil and there he is. [Windbuil with a following of Jews and others. The barber, Hendrik, Eelhart, Beatris, Hillegond and Klaar]. Windbuil: Where is Mr. Bonavontuur? I have to talk to him right now. The west! The West! The West! So sorry I did not greet you first. 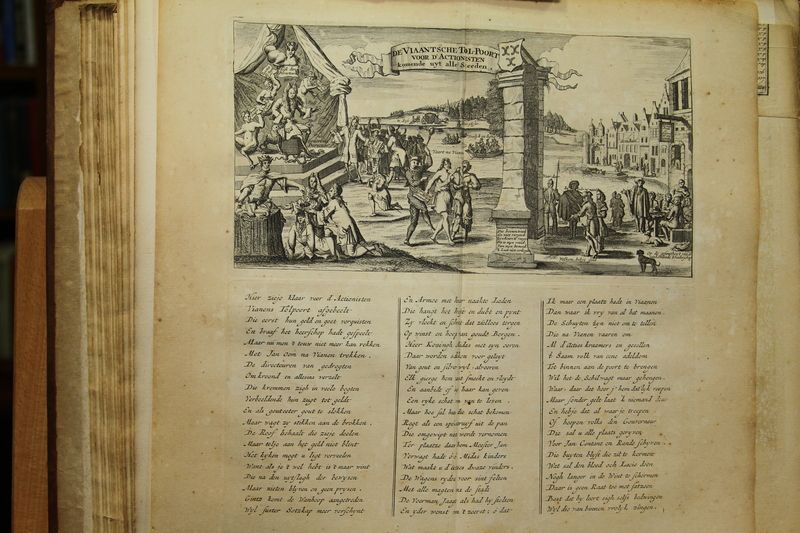 [Windbuil with a following of Jews, who bump into Bonavontuur and two others. Bonavontuur: Ouch, ouch my foot! Windbuil and following of Jews: The West! the West! the West sir! Bonavontuur: My foot is broken. Windbuil and following of Jews: The West! The West! Eelhart: Shut up, what are we going to do? Beatris to husband: Oh dear, what’s wrong with you? Bonavontuur: Oh, get a barber. Klaar: There is the surgeon who shaves you every day. Eelhart: Come on Master, get to work. Barber: They might not want that. They are rich and he is a real gentleman. They have a thousand golden Louis in Quincampoix. Klaar: Whatever, go on, take care of him. Barber: No. I can’t do it. Klaar: I will get someone else. He thinks he is the King of the Waloons . Because he has money, or maybe also some wind. Windbuil: If you take care of him, I will consider you my friend. Barber: Sir, in that case I will do it, as a friend. Come on girl, bring the wounded and the towels as well. Bonavontuur: Please take me next door, and do a good job please. As they are carrying him, they hear calls from inside: Edam! Edam! What’s that? The West! The West! Hillegond: Please, Hendrik, what is wrong with these people? Is Mr. Windbuil totally crazy? Are they making bets? Or are they really drunk? But the worst is, that they are not the only fools and the whole country has this disease. It blew over here from France and because of these traders, everyone will be worse off. But dear, I’m lucky to have a moment for just the two of us. I want to ask you something. Do you want to marry me? Hillegond: We both have to be patient. but I don’t really like him. I prefer you over Windbuil. Then I will appreciate your love and devotion forever. Hendrik: Do I dare to think that you love me? Hillegond: My heart is yours, if we can work this out. Hendrik: What a wonderful moment! I’m yours. Tell me what you want me to do, my beauty, and it will happen. You love me? I did not expect to hear that yet! My posessions, my life, are all in your service. Well, my dear Hilegond, what do you want me to do now? In the stock market. We have to check all his trades. I’m afraid they try to trick him. I think his stock broker lies to him all the time. He tells him only about big profits. And I’m afraid this will only make him lose more. I believe that they all want to bring us down. Hendrik: The servants and the maids? I noticed that he is in with Dad’s trader. They all dream of the commissions. Even the maid is good in these kind of sales. Hendrik: No love, the commissions are too high now for the South. Hillegond: They work together. Krispijn makes the deals. I found two notes in the maid’s room. See, read them, you will know what they mean. That he got some Rotterdam shares. The maid signed up to buy shares of an insurance company. The other says that he was thinking of something in Hoorn. But don’t worry, that will not harm your dad. Hillegond: I am still afraid that nothing good happens there. you, you make me so happy. For a long time I have hoped to find a treasure like you. to speak to you in private? Hillegond: Don’t be rude , sir. Can’t you see that I’m with someone? And I already know what you want. Windbuil: I notice that my fellow suitor knows how to charm you. and I do not appreciate that at all. Why did you start to ask for my hand by asking my father first? Are you here just because you love me? That your beauty made me fall in love with you? Hendrik: What do you mean calling her miss! Aren’t you ashamed……. Hillegond: Be quiet, I know what he is up to. And if anyone asks any more questions, he will never get me. Hendrik: I will be quiet. Windbuil: It’s OK miss. I will be quiet because you told me so. But, won’t you let me make you happy? You will be honored, and taken care of, because you are a lady. I am much richer than most people. You will live like a princess with your lady friends. And there I will build the most beautiful place. Everyone will look at you like you are the main goddess. On which there will be wharves. they will put their sails down and bring the goods. Hillegond: These trades are very profitable for you! The imagined profits will be blown away as well. And I would change from a princess to a lady-in-waiting. Windbuil: Miss, that won’t happen. Calls are coming from the inside. Windbuil: I have to talk to these people. Hillegond: Oh, that is so scary! He is full of wind and foolishness. Hillegond: Let’s go inside, I can’t wait. END OF FIRST ACT . Imagine a coffee house with people smoking etc..
Come jump on wooden clogs and shoes! And they used to sleep on straw. Not for love, but for the money. because all of them dream of getting rich. Keep their horse and carriage in their stables. And play in the wind trade. Because they all become kings. Geesje: Well Frankie, are you trying to play the fool? Or did you also get hit by the windmill? With all this wind you have to wait till a long time. Frankie: Do you mean that I do this for nothing? You’re wrong! I need money, so I have to start something new. he had a hump like mine, and he got very rich. unless my colleague got his share. Because they could easily write on his hump. And they can use my hump as a writing desk. Geesje: Hah! Hah! That is clever. But darn it, he is already making money. Pieter: Give me a pipe with tobacco! and coffee, boiling hot. John: Don’t burn yourself! Gentlemem don’t get burned! Pieter: Did you see the broker Grijpvogel? John: No, but I think he will be here any moment. Oh, there he is already. Grijpvogel to Pieter: Sir, why are you here? A contract for a thousand pounds, he will like that. After it is signed, I will get the commission. Give me a pipe with tobacco. I don’t think that you will get him that foolish. I am sure the South Sea will not go down. Grijpvogel: Where is my coffee! John: Don’t burn yourself. He who breaks it, must pay. First Jew: Are you going to buy or sell? Second Jew: I buy and sell the South. First Jew: OK, wake up! Speak up! I will sell Munkendam to you! First Jew: That does not work. Second Jew: Three and a half. First Jew: I bid three. Second Jew: Join the fools. First Jew: I offer two. And when I turn around it is over! Second Jew: Grijpvogel, stay here. And deal in good conscience, this is your chance. First Jew: Six of them? Second Jew: You got them! Who is your boss? for a man like you, with a nose like Frankie’s hump. He writes on the hump. First Jew: I will sell you Muiden, and Schiedam if you want. First Jew: Don’t you want to make money? There are shares from the Bahamas! Windbuil: How is that possible? First Jew: Are you afraid to make a bid? Windbuil: Smous you are wrong. Why don’t you bid on the South for seven hundred. First Jew: I am gong to pull the shares out of my pocket, can you believe it! Put your glasses on your nose: Read what it says! Windbuil: How much then, mate? First Jew: Listen, give or take thirty. First Jew: No, not for me, not on my life. Second Jew: I’ll sell you Rotterdam. Grijpvogel: What do you offer for Tergou? First Jew: Grijpvogel, take off your hat for me. Urtecht is for you. First Jew: I bid one and a half! Grijpvogel: You fools, leave me alone! Or I’ll smack you in the face! First Jew: You are crazy! Why not make money while you can? Scratch the dirt out of your eyes and act like a man. Pieter: I want a coffee! John with coffee: Don’t burn yourselves, gentlemen. Barber: Come on, sell Enkhuizen and Edam. Pieter: I wondered why I haven’t seen that fool before. The Jews together. The Bank! in November! The Bank! John with coffee: And don’t burn yourself with the bidding! Barber: The Bank! The Bank! Pieter: Are you trying to get me to buy the Bank? Barber: Little Piet, can’t you make a small deal? Pieter: No, let me pass, I have to go now. The Jews raise Frankie up in the air. Swol! Kampen! Cheels! The West! Pieter: I’m afraid I will break my neck here. You won’t be able to get out. Pieter: A cup of coffee! First Jew: A pipe of tobacco! John with coffee: Don’t burn yourself sir. Windbuil: Did you hear from Krispijn about Hoorn? Pieter: There he comes with two or three beet farmers. Krispijn: Who wants Hoorn for eight percent! Come on! The others are selling them for three! Krispijn: I know they will go up. This company is better than Schiedam. And at least as good as Alkmaar, my friend. The Bubble! The Bubble! Bless the Bubble. Who wants to buy wind? Grijpvogel: I bid five and three quart, I want three shares. Krispijn: What do you say Mr. Louw? They write on the hump. Krispijn: Now Mr. Barber, let’s hear it, what do you bid? Barber: I give you five for six. Kees: I wish you lots of luck with that deal. Windbuil: Come give me three, then I will take two shares. Krispijn: Mr. Louw, speak up, what do you bid? Louw: I am not used to whining. But is that really a good deal? Krispijn: I will guarantee it. And good luck with this deal. Louw: Sir it is done. First Jew: Really Krispijn, you know how to fool people. Krispijn, writing on the hump: I need something for my transportation. Pieter: Ah, so Krispijn, you know how to live well. Grijpvogel: Krispijn, you know that I get half of the profit. Jews: Ah, an honest one! Barber: That’s what you guys agreed upon? Krispijn: Don’t be too much in a hurry. That little purse Piet is yours. It is full of gold coins. You are going to get more, that way I can trust you. Nowadays we should not be too honest. Use your brains and think about it. And play the role of two great gentlemen. He will give us the sack. But I’m going to disappear because I see Eelhart in the distance. Eelhart: Give me a cup of coffee and two clean pipes. Windbuil: Sir why did you come here. I don’t understand. Second Jew: Eelhart what do you bid for the South Sea? Eelhart: I don’t trade in wind. I don’t bid a penny. Second Jew: You are a big fool. Windbuil: Sir, do you want to make a deal? Eelhart: Can you make an exchange? Windbuil gives Eelhart an exchange: Yes. Eelhart: This is a good one, tell me what you want. Windbuil: 'k Ben twee miljoenen ryk, en ik heb geld van doen. Eelhart: I want two percent. Windbuil: A month? That is way too much. Half of three quarters, is what I’m thinking of. Eelhart: Then you could not make a deal in Rotterdam. Windbuil: Darn it, I have to do it, I’ve tried everywhere. Who asked me for eight percent for a loan. Because when one pays a lot for wind, it will fly away quickly..
You know money has to yield a percentage. Eelhart writes on the hump. Here, you can get the money from my cashier. He will pay you promptly the agreed amount. Calls are heard from the inside. Tergou! The South, the Fishing industry..
On the stage people are calling. Windbuil: The South. That’s what I want. They all walk out through the door. I have something for you that will make a lot of money. Grijpvogel: Sir, as you know, I am an honest trader. I serve your bosses faithfully; so tell me what to do. But I’ll show you that I am a man of my word. Eelhart: How many shares did my brother buy from you? Grijpvogel: Let me see, if they are in my note book. Six, Sir, of a thousand pound, and seven of five hundred. Grijpvogel: Why does that surprise you sir? That is not much, remember he is a speculator. Your brother usually trades this way. When things go down hill, he’ll be with his legs up in the air. Grijpvogel: That won’t happen. I will tell you the way it works. Then I will deliver them to you right away. Eelhart: And if the buyer does not like that? Grijpvogel: That is not possible, to deliver before one has them. No the deal has to continue from man to man. Try to find all his trades. Grijpvogel: There is a chance that I could do that if you want. Hendrik: The South is now seven. Eelhart: Come let’s make a deal. Pieter: You are so lucky. They go up, when everyone says they will go down. Grijpvogel: Be quiet, you fool, I will pay you half of the profit. I ask sixty up front. Grijpvogel: Well I don’t like it. But we are good friends and I we have a deal. Eelhart: I’ll make sure my bank pays you. Hendrik: Grijpvogel, now we wait for you. Grijpvogel: Gentlemen! Stay here, don’t leave yet. You might make another nickel. The bidding will start in a minute. Hendrik: I can’t wait to see this. And that will happen right here! Grijpvogel: I am going to explain. You will understand what all this crazy trading is all about. that everyone will sign up, if only for the wind. that they can’t see what they are up to. Grijpvogel: The smaller investors, Sir, they are right. They smile to themselves and become rich quickly. Because they know that they will come up with more schemes. Eelhart: I don’t plan to build castles in the air. Grijpvogel: I hear a lot of noise, the whole parade is coming. Hendrik: I see Krispijn with them, what will happen now? Krispijn in his ceremonial suit, followed by all kinds of people, who try to put notes in his hand. First Jew: Sir, here is a note, please take it. (Krispijn throws all the notes out). Get lost, I don’t want your notes. A chair is put on a table, Krispijn is going to sit on it. Some farmers are sitting on the bench in front of him. Back and forth notes are written on Frankie’s hump. Let’s keep this project going. Of the nobel Bubble Company. Warehouses, animals young and old. You will never lose on your goods. These ships are already being built. We are experts of the briny. And all of us will benefit from this. As long as we know they are insured. When he feels like it. Blow up the stock market. Put your notes in this bundle. Is there a policy about commission? Krispijn: What? I don’t know what that means. Krispijn: I don’t know what that means, get lost, go away. Barber, Windbuil, Second Jew and others with notes. Sir, stay here, take it! Krispijn: Well who do we have here? I don’t know you. Do you have good credit? Stop it! I think these people are drunk or crazy. Louw yells from the window. Gentlemen, You can go now; the company is full! Windbuil: How are we full, buddy? We did not drink! Krispijn: We already finished the meat, now you can chew on the bones. Hendrik: That looks like a fraudulent business! Is this a company? I’m sure the profit goes in their pockets. Grijpvogel: Who wants to buy, who! Gijs: What do you have for sale? Tell us what kind of things? Hendrik: Farmer, you can get very rich here. Gijs: What can we buy? Hendrik: They are shares, my good friend. Gijs: How much does it cost? Let me try it, to see if it works. Order me first for half a nickel. Krispijn: Do you think we are crazy? Gijs: No liar, be honest, be honest. What kind of liquor is it? I want to try it buddy. Grijpvogel: It is not liquor: it consists of shares, my friend. Gijs: Yes, now I get it, you explained it to me. Are they like those packages? The quack’s herbs? Well, why are you laughing? Am I a funny fellow? Around here they don’t think so. Gijs: You say, they are atheists? I wish I knew what it all means. Grijpvogel: Well, if you want you can buy a Bubble share. Gijs: Well do you serve these in pints or pitchers? It must be delicious for sure. I understand, because there is a lot of business here. Oh my dear, let me taste it. Is it really good? Each share costs about two hundred pounds. Krispijn: Farmer you better go. Let me see what you sell. There you see, it is paper. ‘t Is probably a little Bubble paper. Is that worth as much as it says on there? Krispijn: Yes, if you buy it, then you can make a profit on it. Gijs: I want to make a profit: but I also love my money. Do you guarantee my money? Krispijn: I don’t guarantee anything. wasted the money, I would only have this paper. But how much interest would you give me every year? Krispijn: Farmer, if I would know that, then I would explain it to you. Then you get a lot; if not…..listen everyone gets his share. But farmer I can’t waste any more time on you. Gijs: You won’t be able to preach my money out of my pocket. I rather buy animals for my farm, my friend. Who would buy these things? Krispijn: You are a fool, farmer. And now I have to go. Gijs: Bye Mr. Governor, I am going to stay away from the fools. First Jew: Sir, please stay, I want to buy some stocks. Ten, twenty, I hold you free of damages. Then you will get all you want. I know that you yourself has a million. So do I, that’s the kind of trader you’re dealing with. Krispijn: Talk to Grijpvogel about this. I don’t want to deal with the small stuff. He is a broker of this company, sir. I can not make trades, because I am becoming the president. Second Jew: Mr. Grijpvogel, let me help you with your business. I am in Medemblik, I can make wind. Grijpvogel: It would be better if you come to my house tomorrow, then we can talk about it. From inside they are calling. The South! The South! The South ? The West! The West? The West? Beatris: I’m surprised that my brother and Hendrik are not back yet. I already heard from his servant that he bought all the shares of my husband. I hope that Grijpvogel did not change his mind. Hillegond: It is strange that he sold them so low. But he is a good business man. I trust that the South Sea really went down. And even if that is true, he made enough money on it already. I don’t think we have to worry about an disaster. Hendrik: My true love, we succeeded in all the things we wanted. Don’t be afraid, there is nothing to worry about anymore. We have all the trades from Grijpvogel right here. Beatris: You saved my husband from a future scandal! Although if he would know about it, he would be upset. I am very grateful that you saved his honor. means more to me than money. Beatris: No brother, no, I am very thankful but you can not pay for the loss and Hendrik, I give you my word that you will have what you want. Hendrik: Madame, I thank you. But who is going to bother us now? Windbuil: Where is Mr. Bonavontuur? It is very important that I speak with him. He is not in Quincampoix, nor in Karseboom or The Dam. I am very surprised that he did not show up. Now is the time to make millions. Shame on him, where is his brain? Eelhart: In the same place as yours, Sir, not at home. Windbuil: Really, where does this gentleman get that idea? But Oh, Miss! How can it happen, that I did not see you before. Please don’t be upset with me because I was callous. I was a little confused. Hillegond: Although you are here, your heart is still in Quincampoix. Windbuil: This heart! This heart! It will burst from love and joy. Hillegond: This heart is so full of trades that it might burst. Windbuil: You mean of love. But I hear Mr. Bonavontuur. Bonavontuur, limping: My dear Windbuil! Windbuil: Sir, where is the spirit, the fire to make you happy now? Right now you can make the biggest commissions. And I hear from London that everything is going down. Come let’s see if we can get some more commissions. I told people that the stocks will go up. My friends are smart enough to also keep the prices up. They will start to sell. Don’t you think they are smart? Bonavontuur: My good friend! My Windbuil! I can’t do that. I can not go out until my foot is healed. Windbuil: Your foot got hurt? How did that happen, Sir? Bonavontuur: You already forgot? You made me fall. Windbuil: I’m so sorry, Sir. I would give a thousand gold ducats if that did not happen. I made a million! Lackey! Lackey! Get my carriage! Eelhart: Sir, that is not good, you have to stay home. Beatris: My love, don’t go out now. What are you going to do in the middle of the night? Bonavontuur: My wealth depends on it. I must go, even if I have to use crutches. But how come I don’t see Krispijn? Does he want to worry me all the time? and it has been three days since I got his letter. He is afraid he’ll get punished. Bonavontuur: Why is that? I hope Krispijn will not deceive me. Hendrik: He is a gentleman, and travels all over the place. To Rotterdam, and then to Tergou, Schiedam and Alkmaar. Oh, I know he is your trusted servant. And didn’t he go to London for you in a fishing boat? so he could become the president of the Bubble Company? Bonavontuur: Well, no, I haven’t seen him in a long time. Eelhart: Then he really deceived you. that everyone had to laugh. But I thought all this business was done for you. And now it seems that you knew nothing about it. I’ll let him know what he has done. about what I have done for you, and I expect that you will reward me well for my trouble and concerns. Bonavontuur: Oh, you rascal! You crook! You’re still putting me on? if you all enjoy talking like idiots. because you will not leave this place before you do. Krispijn: Oh, I am shocked by your ungratefulness. How is it possible? A gentleman like you, who is goodness itself! A gentleman, who I serve day and night! Whose interest, like mine, I have in mind. Than live without his favor. I never did anything bad, why do you hate me? Bonavontuur: I am angry, because you did nothing for me. who did you vote for to become president of the Bubble company? Krispijn: Sir, now I think I get it. Oh no, I think you are misled. I played that game in Quincampoix, to be nice. And they thought this up, just for fun. Bonavontuur: Well Hendrik, what is wrong with that? Krispijn: I swear that that’s how it happened, Sir. And I would like to explain the expenses to you. And from there to Chaize, that cost me three pounds. Krispijn: Sure, otherwise I would have been too late. To stay overnight I had to pay one ducat. Bonavontuur: How can that be! Krispijn: Yes, I could not sleep in the street. Bonavontuur: What! How many bottles of wine? Like two fools with bloody faces. Tell me what profit did you make? Bonavontuur: Rascal! Nothing at all? And you dare to give me these bills? Krispijn: Believe me, I tell you nothing but the truth. ready to sign up, but the company was sold out. Bonavontuur: And without even a “write in” of a nickel? Even before I, and all the other strangers, got there. Everyone then just went back, with hanging heads. Because I would never commit it such a disgrace. at four percent, I brought the contract. Now they are worth seven, that is three percent more. Bonavontuur: You did well, I spoke too fast. Krispijn: I see that you have confidence in me. Eelhart: Just don’t share the profit with another friend. Krispijn: People who think like that really tick me of. Bonavontuur: No, no, Krispijn, I’ll show you how much I appreciate it. Windbuil: Where is that rascal, my driver? Coachman: Sir, the horses are in the stable. Didn’t you get my order? Coachman: Yes sir. But I won’t keep you guessing. I will be honored like a real gentleman. From someone who lost his money. For this, I have to thank my friend Krispijn. Windbuil: Damn it! This I have to see! Go to hell! I’m gone! Four dancers who act like cutters and wig makers. Coachman: Are you coming, gentlemen? Come on, I need some new clothes. Then I will honor this company with a new dance. bother me, please listen to me. Mr. Windbuil, I thought I would find you here. to claim nine shares in the South. Windbuil: I don’t know what that means, demand the return. Grijpvogel: You took the premium when they stood at four hundred. Windbuil: Yes, and let me tell you that I don’t understand this craziness. Grijpvogel: I don’t either, but take it as it is. They are ready to receive the goods. Windbuil: I’m going to give the order. Second Jew: No, darn, wait a little! Windbuil: What I don’t have credit? I own more than two million, that’s an outrage. Second Jew: You are a big idiot. Come to my hotel and we can discuss it. Second Jew: OK, you convinced me, I’ll take two ton of gold out of the bank. First I have to check you out again. Wait six months, I’ll request it from the gentlemen that I deal with. You have to wait till then. Second Jew: I will go and tell the whole deal to everyone at the Stock Exchange. Or I swear I’ll stab you. First Jew: You are a crook. Windbuil pulls his sword: A crook? I’ll show you rogue. First Jew: Hold him darn it, he wants to stab me! Krispijn, while taking the sword away: Get lost before he brakes your neck and bones. First Jew: No I’m going to stay, I’m not scared. Bonavontuur: Stop! Stop it! I don’t understand why you want to fight! Because you want to pay me for the stocks by hitting me. Bonavontuur: Leave; I don’t listen to raving and ranting. Eelhart to Grijpvogel: Now also claim the shares from my brother right away. Grijpvogel: Mr. Bonavontuur I’ve been asked to claim all these shares that you have to deliver up to seven. Bonavontuur: Wow! What’s all this? Is everybody crazy? Or is there some magic going on. Eelhart: Dear brother, you think that your credit is high enough for these trades? Grijpvogel: Sir, the price of South Sea will go up in time. Bonavontuur: If that is true brother, then I have lost everything. Grijpvogel: Go ahead and buy for me up to seven. Grijpvogel: Sir, they already went up to nine. Say, if you like, Windbuil will have to check their credit then you can delay the claims. Eelhart: I hope you will not do such a thing. Bonavontuur: Even I have to lose my capital, my credit is worth more, I will never do that. But why did you get me in this dangerous situation. I did everything you advised me to do, you are my broker. Grijpvogel: I don’t understand anything of this craziness. This one wins and that one loses. I also would like to make a profit. Windbuil: Hah, Hah! I just thought about something that’s profitable for us. I lose now, but soon I will become a man of power. Bonavontuur: Why are you not able to pay for the shares? Windbuil: Because I have to get my capital from France. The Mississippi Company is the source of my capital. I have at least two million in paper money. Coachman: Sir, I can hear that you need money. Windbuil: You rascal! Do you have to bother me with this attack. Gentlemen, I have thought of a great project. Via a subscription of a hundred million. has to pay three guilders to sign up and because of this treasure we can do business with Ostende. Krispijn: Go away sir, that is worthless. It would be better if the bubbles would not absorb the profits, because this way I can not see an advantage. Merge these companies into one conglomerate. while the business is curtailed by these bubbles. In time they will make you look like a fool. Have to be paid out in two years to everyone. Because they would risk their honor with such bad business. Who does not go with this kind of wind. I would start a company in Vianen. Will be sure to still have a house there. Go, and discuss this with your friends over there. Windbuil: Sir, do you accept such language from your servant? Windbuil: Damn! I’m going crazy, how is this possible. But I thank you for all the good things. Because I know that you will walk from now on. Windbuil: If I had my sword, you crook, I would stab you. Krispijn: Don’t get so upset, I’m only human. But you don’t want to judge me yet. which you were not aware of. that I want to please you. Bonavontuur: My money! Krispijn, my money! how did you dare to do that? Eelhart: Dear brother, don’t worry, because it did not hurt you. Like he should and then he is free of any bad suspicions. the damage is that will be coming to you. Hendrik: Sir, may I hope to make your lovely daughter mine? Bonavontuur: Give her your hand: but I demand that you never shall sell wind. Krispijn: Miss Klara can you also give your hand to Krispijn. Klaar: Long live the Quincampoix now that we are united. Krispijn: Let’s have some fun, before we leave together. Windbuil: I’ll cover myself with Vianen or Frederik Hendrik. END OF THE THIRD AND LAST ACT. I use the Frederik Hendrik coins (instead of the paper shares and obligation certificates) to protect myself from my debtors. Or I go to Vianen for which I won't feel ashamed in the least. Because of the fraudulant stock market, many honest people were cheated and lost their money to the crooks. You, Mr.Bungler, director of rogues, you can push ahead but the game is over! Listen up you city people, commoners, farmers... Hear me! I've all kinds of bonds for various locations... and in huge quantities. Who wants to buy these stocks and bonds at very low prices? First of all, I've bonds for the city of Dort. These are going down as we speak. Then we have bonds for the city of Rotterdam. Don't make fun of these...they are already rotting (becoming worthless). And what about Schiedam...how much are these bonds worth? Next is the city of Woerdenwith her magic tile business. These bonds will make you cry. Then you have Delftshaven together with the city of Delft. Too bad... the value of these bonds are already less than half. And how about crazys' Gravenhage [The Hague]. Anybody who buys these bonds will be sorry. And Utrecht with its new canal? These bonds are worth just about nothing. Hey, what do you offer for Hoorn? Everything in Hoorn will be worthless. And about Edam or Purmerend? These nobodies rather sit on their behinds. Well how about Medemblik or Enkhuizen (important harbors for ocean trade)? They issue shares for ships yet to be built. And how about Vlaardingen or Maassluis? These knitters of fishnets are not to be trusted. I have to say that the bubble mania was here as well. Well, well...look there is Alkmaar. It's location is very difficult for ocean trade. Well how about Muiden or Naarden? These shameless folks are worthless. Come on...why not Wezip which is very cheap. Get rid of these pork bubbles...Run, run!!! Then we've Tergou with its flax and grain. They are lying ,yawning and joking. And how about Hasselt, Eemden, Steenwyk, Zwolle? These are even worse...Have you had enough? OK, if not, you can buy bonds of cities in the province of Zeeland. This could be good in times of war but not so much when there is peace. I'll chip in everything at no profit with the understanding that I don't have to worry about getting a downpayment from you. Look I'll give you any bonds and shares. Wow...still no buyers? That's unusual! Come on...make a bid below market value. Wow...still no buyers? This beautiful deck of playing cards is originally included in the book Het Groote Tafereel Der Dwaasheid. We have translated the text into English and stylized them as more modern playing cards. This collectible deck of cards will serve as quite the conversation starter at friendly gatherings. Hillegond. Please, Hendrik, what is wrong with these people? Is these traders totally crazy? Are they making bets or are they really drunk? But the worst of it is that they are not the only fools. The whole country has this gambling disease. See article from Wall Street Journal on this book. The two characters in the song below are Mr. Gelderman from the province of Gelderland (he is the "good guy") and Mr. Hollander from the province of Holland (he is the "wind trader"). H. We want to eliminate poverty, a curse that rages in our region. G. Who is complaining about that? Here, everybody, young and old, is content with their lives. H. Surely! Happiness would not have eluded you, had you gotten in with the "wind trade". G. No wealth would please us if it comes from crooked and corrupt players. H. I don't care how one makes a profit as long as it is real cash. G. The old sailor navigates trough the gates of hell in order to make exhorbitant profits. H. Then there are the poorly paid potato farmer with their fruit and farm products. H. Right! People of the Province of Holland laugh at the little poor guys. He who has money gains everybody's favor. G. The notion that nobility and wealth are more important than anything else is detestable. H. Nothing is more honorable than to dig into the earth with spades and shovels when the cash in the wallets becomes less and less.That's how people in your Province of Gelderland try to do this. G. That's better than what the bankrupt scroundrels did when they fled to Vianen in order to be safe. H. This disaster nobody could prevent and he whose back is against the wall deserves to be saved. G. With the law of Emperor Charles. H. Justice that is too strict will fail. Moderation will comfort the public. G. That's how one can sqeeze blood from the people by requesting tax money that they don't have. H. How does that affect the stock market which you criticize so much all the time. G. Don't mention your godless ways. It already has ruined your prosperity. G. If everybody got justice, it would be acceptable. But injustice has now infiltrated everywhere. H. But the disgruntled government people in the Hague know how to rule and people complain about that. G. But the displeasure of these honorable people of the Hague and their whores hits home and that causes bitterness and they fight till the end. H. Who is jealous? Who profits the most from the "wind trade"? G. The gentlemen from the Hague and their whores. They play the games of foolishness and idleness. H. I thought that you wanted to move somewhere else like joining the rebels in Dord. G. I have never seen that one can squelch a rebellion when people's rights were curtailed. G. That's where money grubber Law was hanged. Your region of Holland was considered to be safer. H. This desease is not everywhere. Haarlem and Leyden are clean. G. One should bestow a golden city crown on these praisworthy cities. H. And Amsterdam may brag as well. And Gorkum...the pride of Arkels Fortress. G. However, Dordrecht did not get the crown and I won't even speak of the other plundering and corrupt places. H.Your province Gelderland has remained pure, wow what an untouched virgin! G. That's right, she was praised for not having any crazy and corrupt businesses. H. We grant you that empty glory like a disappearing shadow. G. We hate the terrible "wind trade" and not just because of the money. G. Much further than the money grubber with all his wild dreams about the raging stock market in Quincampoix on the river Y.